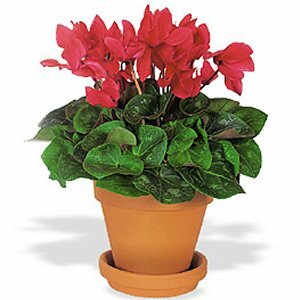 Cyclamen is a low European perennial plant; the bulbous root sends up long-petioled, leathery, cordate, palmately veined leaves that are dark gray-green with lighter spots on top and reddish underneath. From June to September the drooping flowers, varying from white through pink to red-violet, appear on naked reddish stems which roll up at seeding time so that the seeds ripen under the protection of the leaves. Found in the Mediterranean area, the Alps, and other mountain forests. Used popularly by Europeans. A decoction of the dried bulb is used for dropsy, mucous congestion, colds, flatulence, and intestinal worms. The powder is used to help heal purulent wounds. Even small doses of cyclamen are poisonous to humans. Pliny the Elder reported its use as a poison for arrowheads.